Andrew visited Brisbane in October 1996 and played a solo performance at the Conservatorium of Music and this photo was taken just afterwards. 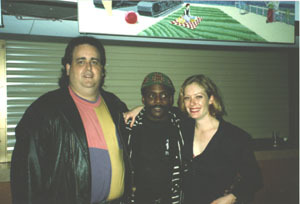 I am to Andrew's right, in front is the promoter Lynn Irwin and my friend Stephen is at left. Sadly Andrew has left our presence. DAVID MURRAY Home Page - This site also includes info about the World Saxophone Quartet and links to discographies of Arthur Blythe, Oliver Lake and Butch Morris. David felt like partying after the WSQ played at the Brisbane Festival in 1992 so we ended up in the Brisbane Jazz Club at Kangaroo Point and he sat in with the band. He did 2 numbers including Body and Soul with local pianist Jeff Usher. DM told me he really liked the girl who played guitar and sang - it was a while before I pointed that it was actually a long haired boy! (No that's not him - that's Rob Jackson's wife). I caught up with after 17 years when he head lined the Brisbane Jazz Festival in October 2008. Still great! Ex-Mingus sidemen George Adams (RIP) was an amazing tenor player. Along with other Mingus alumni Don Pullen and Danny Richmond he formed the Adams-Pullen Quartet with Cameron Brown filling the bass position. 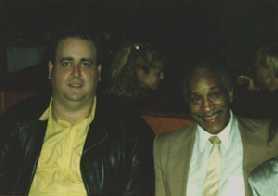 This photo was taken by Joe Segal for me in his jazz-club in Chicago in 1991 after a performance by Mingus Dynasty. 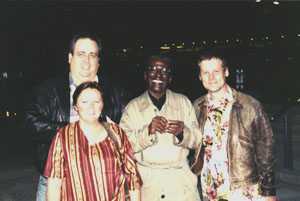 On the left in bassist Ray Drummond, and George Adams is at centre. Check the sweat on his clothes - he really gave a great performance. Legendary Chicago tenor saxist Von Freeman seems sadly under-represented on the internet. 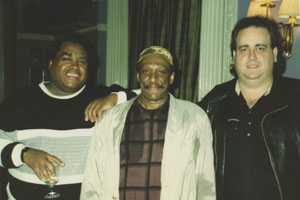 This photo of myself with Von was taken after a gig in Chicago in 1991. He was surprised to meet a fan all the way from Australia. My interests include jazz, rock and folk music, drumming, photography (including collecting and researching nineteenth century Australian and New Zealand photographic history) and collecting old postcards. I squeeze these in between working as a general practitioner in Brisbane, Australia (not quite the jazz hub of the world!). My historical photography interests and family history are covered over at Marcel Safier's Ozemail Home Page.